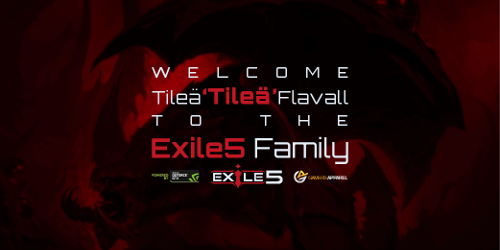 SC2SEA.com - Starcraft 2 SEA eSports Community Site > Site Portal Forums > Latest News > [SEA News] Team Exile5 welcomes Tileä to its professional roster! Exile5 has had a tradition of strong Zerg players in SEA, so with PiG spending more time at the casting desks of major events, and KingkOng giving priority to the completion of his studies, we were glad to acquire the talents of Tileä for our team. I first met Tilea back in 2012 for WCS Oceania and one of my earliest memories of her was that crazy, epic series against mOOnGLaDe. In fact, that is one of the most memorable moments of that entire event! Tilea is known to be extremely friendly and is well respected in this region. It is an absolute pleasure to have her on board now as part of our x5 family. I can't wait to watch her play in the upcoming team leagues! Exile5 has long had a policy of recruiting ANZ based players however with recent developments in online tournaments and in particular online team leagues, the team has decided to broaden it's horizons. A purely chance conversation brought us together with Tileä. Tileä is one of the most well respected players in the Starcraft 2 community for both her skill (and in particular mechanical abilities) and her love and passion for the game. She is looked up to by many players and happy to dispense advice and help others. We're honoured to have Tileä join the x5 family and can't wait to cheer her on. To celebrate Tileä's arrival on the Exile5 roster, an interview was conducted on behalf of Exile5 and the OSC to let folks get to know her better. Please cheer her on, and give her your support and a follow: @x5_Tilea and twitch.tv/tilea ! Tilea was a lot of fun to watch play, glad to see her come back.